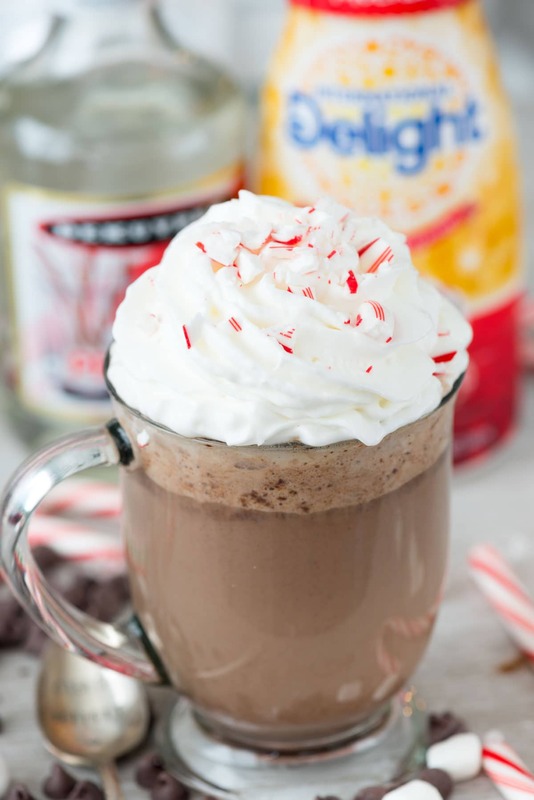 Slow Cooker Peppermint Mocha Snugglers are great for kids or adults! Make a Crockpot hot chocolate recipe with peppermint coffee creamer for the kids, then add espresso and schnapps for the adults. This drink will keep you warm all season long! On our first New Year’s Eve in Arizona our neighbors had a block party. This was years ago, back in 2002, before we had Jordan, when we were just a young newlywed couple. It was the first time I was ever away from home and my friends for the holidays, but luckily I’d made good friends with my neighbor across the street. (Actually, it was the first time I’ve ever become friends with a neighbor. She was so nice and we were great friends until we moved back to California where my next neighbor friendship wasn’t so great…and why all my neighbors are now kept at arms length). Anyway, I digress. So, New Year’s Eve. It was Arizona, remember, so it was cold but not cold like it gets in the midwest. No snow, no rain, just cold. We all hung out in our front yards all night long, doing what, I don’t remember. I remember being cold, and wearing a huge coat, and I remember gunshots going off at midnight (I KNOW, RIGHT?) and I remember drinking Snugglers out of a travel coffee mug. Have you ever had a Snuggler? I know it sounds like an adult onesie, but really it’s a drink. It’s hot chocolate with peppermint schnapps so it keeps you doubly warm…and tastes like Christmas in a glass. Every year I make Snugglers at Christmas and I think, “I should share this on Crazy for Crust” but then it’s after the holidays and I forget. This year I’m totally on top of things! Not only are Slow Cooker Peppermint Mocha Snugglers great for adults, but the recipe can be made kid-friendly too, and it’s made in a slow cooker! There are a million crockpot hot chocolate recipes out there, made with cocoa or chocolate chips, milk or heavy cream or water. 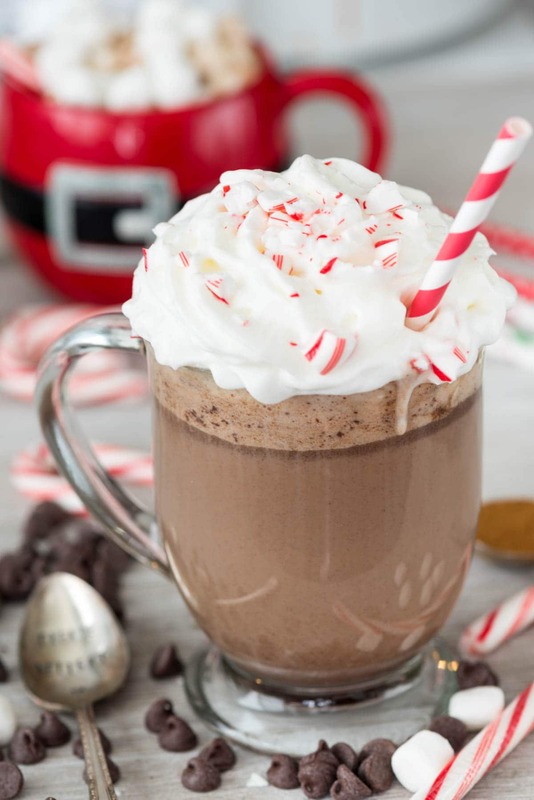 This one is different: it’s a Peppermint MOCHA recipe! But it’s great for kids and adults, so coffee is optional. Slow Cooker Peppermint Mocha Snugglers take about 5 minutes of prep time. Just mix the 5 ingredients in your crockpot and heat on high, stirring every 30 minutes, until the chocolate is all melted and your house smells wonderful. The sweetness comes from sweetened condensed milk, the body comes from milk, the chocolate comes from chocolate chips (use your favorite kind), and the peppermint mocha comes from my favorite coffee creamer. I replaced some of the milk in a regular crockpot hot cocoa recipe with the peppermint mocha coffee creamer. 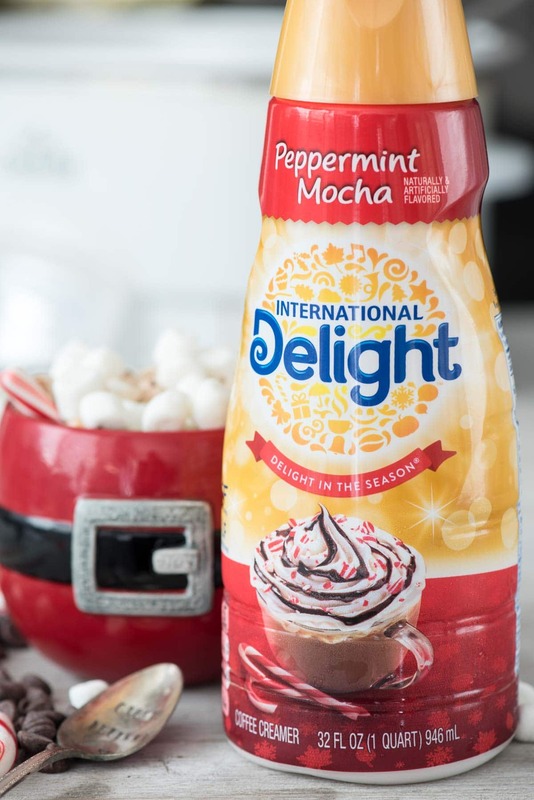 This adds a deliciously deep peppermint flavor to the hot chocolate. Alone, the chocolate is great for kids, with just that little taste of mocha and no actual coffee. Top it with marshmallows or whipped cream and send the kids to watch Christmas movies. Once the kids are out of the kitchen, you get to have some grown up fun with your own Snuggler. Make them more mocha by adding a packet of instant coffee or 1-2 teaspoons of instant espresso powder to your glass before adding the cocoa. It tastes better than the coffee house! Add an ounce (or three) of peppermint schnapps to your mug. No one will know. I think I’m ready to decorate for Christmas. How about you??! Add sweetened condensed milk, chocolate chips, coffee creamer, milk, and vanilla to a 5-7 quart slow cooker. Stir to combine. Cover and cook on high for 2-4 hours, stirring every 30 minutes (whisking if necessary to make sure to mix up the chocolate as it melts) until it's hot and the chocolate is all melted. Serve warm plain, or with the following options. For kids: top with whipped cream and/or marshmallows. For adults, do one or both of the following: add 1-2 teaspoons of instant espresso powder or 1 packet instant coffee per 8-10 ounces of hot chocolate and/or add 1 ounce of peppermint schnapps (to taste) to your serving of cocoa. Check out all sorts of International Delight recipes on Facebook, Pinterest, Twitter, and Instagram. GET ALL MY DRINK & COCKTAIL RECIPES HERE. Love how these delicious drinks come together in a crock pot! Usually whenever I make anything minty I use creme de menthe, but this is definitely calling my name. This is the kind of winter drink I need after the cat knocks over the Christmas tree. ? Looks fabulous but what I really want….is that santa claus mug!! HOW CUTE!! Ooo can’t wait to be snuggled with this! Wow I love this recipe and perfect for the holidays. Who wouldn’t enjoy a mug! Oh my gosh I want to snuggle up to this ASAP! I would LOVE these for parties and get togethers this winter. So easy, but so good! So glad you got ahead of your regular holiday routine and found time to share this! I could go for a big mug of this right now!! Yum! Who could resist a fun drink like this?! I want a snuggler! Such a mouth-watering drink! I would love this so much! I love that this can be made in the slow cooker – and I’m totally okay with ALL THE CHRISTMAS THINGS once Halloween is over 🙂 also, love their creamers! Holy cow! What an incredible drink for the entire holiday season!!! Must buy more creamer for sure!! !